I can’t believe that the campaign is almost over and the goal is so close! I have been asked why do I go on these trips – I can only answer by saying it feels right to me. I have been given so many opportunities through my life and career – it just feels right to give back. How can I ask people for money? Well I honestly could not afford to do this work without the kindness of others. There are many people who dream about doing what I do but for many reasons cannot – this is a way for them to share in my journey. This is a way for them to make a difference! So today with just 40 hours left I am asking for you to help me reach my goal. Your donation will help a child rescued from child traffickers and violent abuse have a much better chance in life. We (the team of us) are going to clean, paint, build – but we are also going to play with the kids and give them big hugs – to let them know that there are good people in the world. At the Anwesha Children’s Home these children are taught many of the basics we take for granted – which can be as simple as personal hygiene – they are given an education – something a lot of the rural children living in poverty do not get. There is a counselor living on-site to help them through the rough patches. These children have been given a second chance – a second chance to have a childhood, a second chance grow up and become strong and productive adults. Who knows what they will accomplish? If you cannot donate – please help me by spreading the word – tell your friends, family and co-workers. Thank you to everyone who has donated – the campaign has reached $2200.00 – 63% of the goal! Won’t you help me reach my goal? Author Linda LaBellePosted on June 19, 2014 May 19, 2017 Categories IndiaTags India, trip to IndiaLeave a comment on Campaign ends soon! Returning to India – Need a Little Help! I have had the opportunity to travel and teach in some pretty amazing parts of the world. Often I have to raise the money for the trips. I volunteer my time and the monies raised cover travel expenses and materials. In the past few years I have traveled to Mexico, India, Rwanda, Kazakhstan and Turkmenistan to teach natural dyeing, weaving, and entrepreneurial skills such as marketing and bringing a product into the 21st century marketplace. These trips are only possible with the help of people like you! Well, I am about to embark on another trip – but this one is a little different – I am volunteering at a Children’s Home (orphanage) in India for 3 weeks, where we will be cleaning, painting, building and making a safe playground for the kids. These children have been rescued from child traffickers and violent abuse. 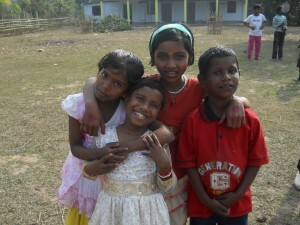 At the Home they are safe, well cared for and receiving an education. Won’t you help to make this trip possible! The funds raised will help to pay my expenses to travel to India to volunteer at the Anwesha Children’s Home (orphanage). Who is this trip through? As a Whole Foods team member I applied for and was awarded the 3-week volunteer trip to India. The Whole Foods Team Member Volunteer Program will cover my food and lodging while in India – I must raise the money for the remaining expenses. For the India trip Whole Foods has partnered with The Miracle Foundation. Originally we (the team of volunteers) were scheduled to travel and volunteer at a Children’s Home near Varanasi. The Miracle Foundation asked that we instead travel to Tripura to a Home that has greater and more immediate needs. The Anwesha Children’s Home has 51 orphans – rescued from child traffickers and violent abuse. My Indiegogo campaign has reached 39% of the goal or $1370.00 of the $3500.00 goal. Thank you to those folks who have already donated, helped to spread the word and wished me good travels. While I still have a long way to go to reach my goal I believe that with your help it will happen! Author Linda LaBellePosted on June 12, 2014 May 19, 2017 Categories IndiaTags India, travel expenses, trip to India, Whole FoodsLeave a comment on Returning to India – Need a Little Help! I have had the opportunity to travel and teach in some pretty amazing parts of the world. Often I have to raise the money for the trips. I volunteer my time and raise money for travel expenses and materials. In the past few years I have traveled to Mexico, India, Rwanda, Kazakhstan, Turkmenistan to teach natural dyeing, weaving, and entrepreneurial skills such as marketing and bringing a product into the 21st century marketplace. Well I am about to embark on another trip – but this one is a little different – I am volunteering at a Children’s Home (orphanage) in India for 3 weeks, where we will be cleaning, painting, building and making a safe playground for the kids. And I need your help to make this trip possible! My Indiegogo campaign has reached 17% of the goal or $590.00 of the $3500.00 goal. The funds raised will help to pay my expenses to travel to India to volunteer at a Children’s Home (orphanage) for three weeks. Originally we (the team of volunteers) were scheduled to travel and volunteer at a Children’s Home near Varanasi. Just a few days ago The Miracle Foundation asked that we instead travel to Tripura to a Home that has greater and more immediate needs. 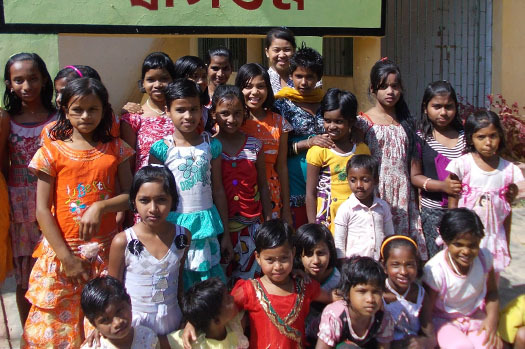 The Anwesha Children’s Home has 51 orphans – rescued from child traffickers and violent abuse. Author Linda LaBellePosted on May 8, 2014 May 19, 2017 Categories IndiaTags India, trip to India, Tripura India, Wholefoods Volunteer Team MemberLeave a comment on Returning to India – need a little help! With a strong belief that you must respect the craft, materials and abilities of the cultures with which you are interacting, I have been able to travel and share my knowledge with those less fortunate. To be able to teach a simple craft that we often take for granted to an individual or group that can in turn empower them on the road out of poverty is an experience like no other. It is both humbling and incredibly exciting. In 2009 I traveled to Munnar, Kerala in Southern India and taught a natural dyeing workshop at the Aranya Natural Dye Unit- the above photo is of the amazing folks I had the privilege of working with! This fall I have an opportunity to return to India, where I will be volunteering at an orphanage in Varanasi – won’t you help me to return to India? The trip will take place Sept 26th thru Oct 16th, 2014. The other volunteers and I will be building a playground for the children, providing them a clean and safe place to play. I also hope to be able to fly across India at the end of my stay and visit the Aranya Natural Dye Unit to say hello and see how everyone is doing there – to hear their laughter and give them big hugs! This has long been a dream of mine and you can help to make it happen. I am looking to raise $3500.00 to cover my airfare. The rest of my expenses will be covered by Whole Foods Market’s Team Member Volunteer Program. As a Whole Foods team member here in Asheville, I was fortunate enough to be chosen to participate in this program. I have written two books celebrating the people I have worked with (Stories of Hope – Mexico, India & Rwanda and Stories of Hope -Oaxaca, Weavers of Southern Mexico) and will do another book, Stories of Hope – Varanasi. Over the past several years I have been able to travel and teach in so many parts of the world, India, Rwanda, Mexico, Turkmenistan, Kazakhstan, in Italy – with middle-schoolers on a US Military base whose parents were stationed in Afghanistan and with NYC 6th graders through the SIlk Road Connect Project. Stories of Hope is a sponsored project of Fractured Atlas,(https://www.fracturedatlas.org/) a non-profit arts service organization. Contributions in behalf of Stories of Hope may be made payable to Fractured Atlas and are tax-deductible to the extent permitted by law.